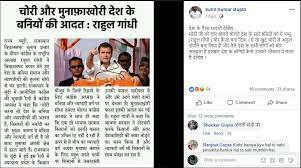 An image of a supposed newspaper clip claiming Rahul Gandhi had called the baniya community thieves has gone viral on social media. 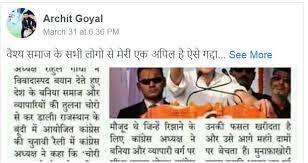 The headline of the clip, in Hindi, translates to ‘Indian baniyas are habituated to theft and profiteering: Rahul Gandhi’. 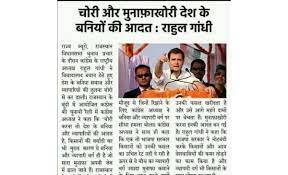 (Translated from Hindi: चोरी और मुनाफ़ाखोरी देश के बनियों की आदत : राहुल गाँधी ). 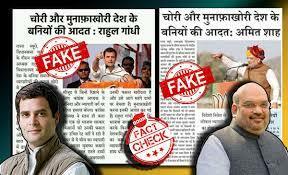 As per the news report, Rahul Gandhi had made the comment ahead of the Rajasthan assembly election last year. The report further claims that Gandhi was addressing an election rally in Bundi, Rajasthan, when he made the statement. Archived version of the Facebook post can be accessed here. BOOM tried to look for the news reports carrying the statement made by Rahul Gandhi on the particular community. However, we could not find any. The fact that the newspaper’s name doesn’t find a mention anywhere in the report makes the claim all the more fishy. 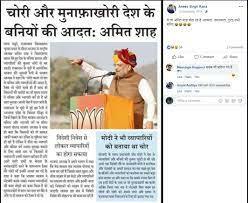 Interestingly, a similar newspaper clipping with the same statement attributed to Bharatiya Janta Party President Amit Shah was shared on Facebook on December 10, 2018. The post with the exact same statement attributed to Shah had gone viral in December last year. Barring few words here and there, the lede of both the supposed new reports are similar. The version wherein the statement is attributed to Shah reads: Ahead of the Rajasthan Vidhan Sabha campaigning, BJP national president Amit Shah, while making a controversial statement, compared the baniya community with thieves and racketeers. At a BJP election rally held in Bundi, Rajasthan, the BJP president said stealing is a habit of the people of baniya community and businessmen. They don’t only avoid paying taxes but are also the main reason for the state of farmers in the country as these are the communities which keep all the profit in their pockets. In the version with Rahul Gandhi in it, the words BJP and Amit Shah have been replaced with Congress and Rahul Gandhi.